Kindly follow all links in the text below to sources and references! 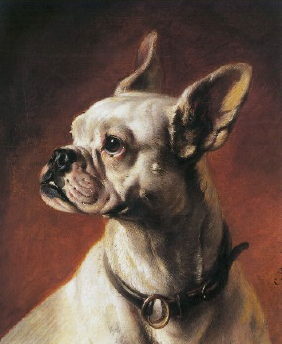 French and English Bulldogs are both included in a non-public x-ray screening database project for Tracheal Hypoplasia with the American OFA. In Sweden only English Bulldogs participate in a Trachea x-ray project for normal windpipes in breeding - in cooperation with the English Bulldog Breed Club in Sweden SKEB, the Swedish Kennel Club SKK and the Swedish University for Agricultural Sciences SLU, Dept. of Veterinary Medicine Image Diagnostics. The French Bulldog Breed Club FBK has so far not been interested in tracheal x-ray. Both breeds often have malformed and narrow windpipes, just like Pugs and other short nosed breeds. The trachea can sometimes be so thin and narrow, that it can be compared with constantly having to breathe through a drinking straw. 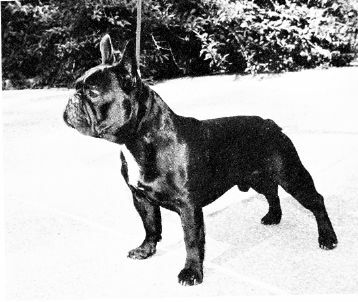 Much would be gained if only Frenchies with normal tracheas were used in breeding and if all breeders had sires and dams windpipe x-rayed before their first mating. Tracheal x-ray is not very complicated and no sedation is necessary, so it is simpler and cheaper compared to Hip Dysplasia x-ray, which is demanded in many other breeds. The nostrils are often pinched from birth, the nose-wings contract when breathing in, which causes a constantly stuffed nose. Go to acvs.org to see examples of stenotic or pinched nostrils (fig. 3) and normal, open nostrils (fig. 3a) and more. A short nosed dog has the same structures in nose and throat as a dog with a normal length nose - but in a much smaller and crumpled area. This is why the soft palate of a French Bulldog and Pug etc. often is far too long and covers the airway at each breath. A dog must have a nose long enough for a normal length soft palate. It is hardly possible for a very short faced breed to breathe easily and naturally. A dog must have wide open nostrils to allow normal breathing through the nose. 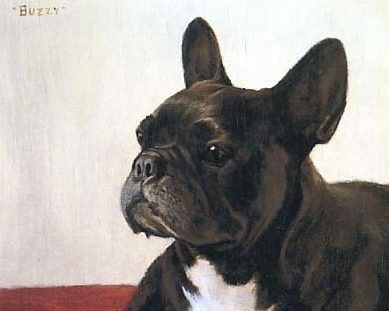 Sometimes long soft palates and pinched nostrils are discretely operated on - and there are French Bulldogs, who seem to be able to move around and breathe without problems. A Frenchie who needs surgery in its airways should of course not be used for breeding. French Bulldogs, like all short faced breeds have especially limited breathing capacity during stress and in hot weather, because few of them can breathe effectively with an open mouth and hanging tongue. In real bad cases the saliva may be whipped into a compact white frog like whipped merengue egg whites by the troubled breathing and the long soft palate - which could provoke suffocation. The whipped saliva can sometimes melt down, by gently sqeezing juice from a plastic lemon down the insides of the dog's cheeks. IT IS IMPORTANT NEVER TO LET A SHORT FACED DOG GET OVERHEATED AND STRESSED OR OVER ACTIVATED IN HOT WEATHER! At the worst a Frenchie or a Pug and other short muzzled breeds can suffer a Heat Stroke or a Tracheal Collapse, which can be immediately life threatening. The windpipe (trachea) looks like an oldfashioned bathroom shower hose and is kept open by thin rings of cartilage - which can break and squeeze together - like used staples - when the strain on them gets too heavy. 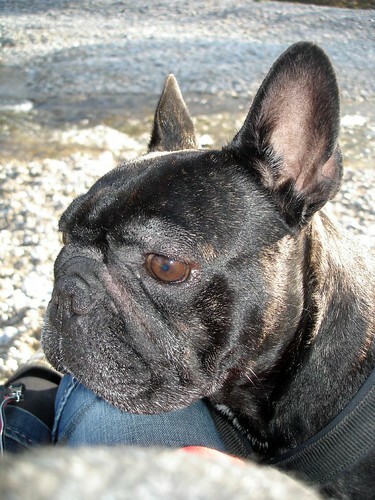 Frenchie Louis in Berlin has a tail, a nose and open nostrils. See yet another original old and sounder type of Frenchie. No breeder really wants to breed and sell disabled puppies. for a better health and function in the future? and a good quality of life. Kennel Club breeders must follow the official breed standard and breed Frenchies, who are awarded prizes at shows. Puppy buyers can choose the type of French Bulldog they want to own and live together with. The extreme breeding in many breeds could not continue without an ever more advanced animal health care, where the arising problems are left to the puppy buyers and their veterinary surgeons and insurance companies.